The 2017 edition presents an analysis of the 5G ecosystem evolution over the past year. It highlights key achievements of phase 1 projects alost two years after launch. On concrete phase 1 project results, fifteen “Golden Nuggets” have been identified and disseminated. On trials, the Trials WG has elaborated a solid and comprehensive strategy to develop the Pan-EU coordinated trials as well as international trials with non-EU partner countries. On spectrum, the inter-5G PP WG has not only produced white papers it submitted to relevant bodies but organised a dedicated workshop with prominent specialists. Key achievements also included strong presence and participation at MWC’17, EUCNC’17 and organisations of cross-project workshops. ➧Do not miss the European Annual Journal’17 and download it here. 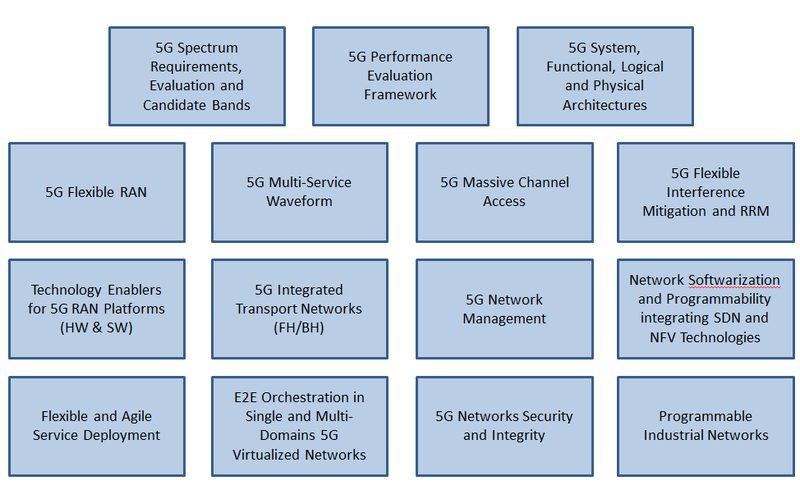 The 5G Infrastructure Association has launched an activity in 2016 to first, generate a strategy for developing a Pan-European 5G Trials Roadmap, and then, second, to prepare the comprehensive Trials Roadmap. 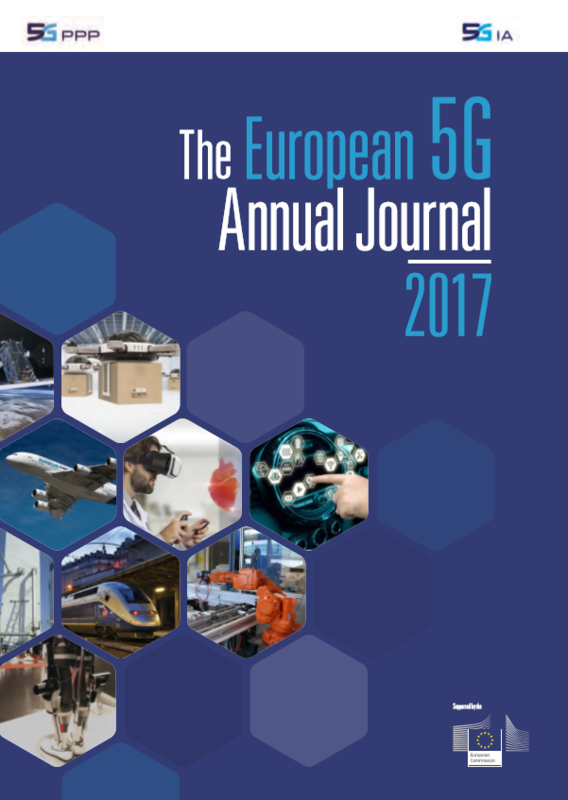 To generate these documents and roadmaps the 5G Infrastructure Association initiated and coordinates a 5G Trials Working Group expanding the work initiated by the Industry and EC in the context of respectively the 5G Manifesto of industry in Europe and the 5G Action Plan of the EU Commission. Support global European leadership in 5G technology, 5G networks deployment and profitable 5G business. Validate benefits of 5G to vertical sectors, public sector, businesses and consumers. Initiate a clear path to successful and timely 5G deployment. Expand commercial trials and demonstrations as well as national initiatives. ➧The Trials Roadmap can be downloaded here. Finding Spectrum for a new generation of cellular technology is not easy. Euro-5G came up with an innovative process for a research community to contribute to the spectrum debate that was termed “5G pioneer bands”. At the very outset the Radio Spectrum Policy Group (RSPG) challenged industry to define the problem to be solved for 5G. Euro-5G responded to this rigorous approach with papers to 5G Infrastructure Association (5G-IA) Worlking Group (WG) 5G Spectrum that revealed that one 5G Spectrum band was not enough to meet divergent future market needs for both capacity and coverage. The Spectrum for 5G Workshop organised in June 2017 proved to be very useful. Identifying the next mobile band(s) beyond the three 5G pioneer bands with the focus on WRC-19 and bands above 26 GHz. Innovative spectrum sharing/licensing arrangements where careful research is needed to ensure robust approaches to minimising harmful interference. Both require technical inputs and both raise industrial sensitivities that may, at times, make rapid progress challenging. A lot of 5G PPP projects phase 1 and 2 will take the opportunity of the Berlin Week to promote their activities. 5G PPP phase 2 projects MATILDA and 5GTANGO co-organise the 4th Workshop on Network Function Virtualization and Programmable Networks (NFVPN) in conjunction with the 3rd IEEE NFV-SDN conference. The Workshop is chaired by Ioannis Giannoulakis, NCSRD Greece, Evangelos Markakis, TEIC Greece, Josep Martrat, ATOS Spain, George Xilouris, NCSR Demokritos Greece, Anastasios Zafeiropoulos, UBITECH Greece, and Carlos Jesus Bernardos Cano, Universidad Carlos III de Madrid Spain. 5G PPP phase 1 projects SONATA and 5GEx jointly organise the third IEEE Workshop on Orchestration for Software-Defined Infrastructures (O4SDI) with 5G PPP phase 2 project 5G-T. It addresses the challenges that will facilitate orchestration and programmability of generalized virtual functions in Software Defined Infrastructures (SDI), enabling cloud and network providers to deploy integrated services across different resource domains. Orchestration mechanisms will facilitate the live deployment and lifecycle management of these virtual elements, at the application level, the server level, and the network level within a single domain and across multiple domains. Without such orchestration it will not be possible to enable dynamic establishment of generalized virtual functions chains, according to service requirements. -In addition, 5G-IA was asked to give a talk on 5G testbeds. Two Infodays have been scheduled till YE2017 so far. The infodays will explain the nature of the different calls, share some suggestions on the nature of the projects expected, and – most important – give a the opportunity to present ideas and seek like-minded partners for proposals. ➧For additional information on the Slovenian InfoDay please click here. This year theme is around Ready’n’Go – 5G Trials and Testbeds. The meeting will emphasise technical capacities to bring forth new and innovative products and services, in verticals such as manufacturing, transport, energy, health, education and entertainment. 5G PPP Projects will be there (SONATA, 5GTANGO, 5GCAR, 5G-Crosshaul, 5G-Transformer…). ➧Find the programme here or there to get more details! The 39th annual DigiWorld Summit will have as its central theme: Investing in our Digital Future. It will be an opportunity to engage in a meaningful international debate over the strategies of investments that the digital actors should implement to generate return on investment and stimulate economic growth, which have become major sources of concern for all the ecosystem’s stakeholders. Ultrafast broadband, video content, the Internet of Things, Industry 4.0, Artificial Intelligence…: where is the money going? The big picture: what are the key investment trends around digital technology? Who is investing, in what and based on what beliefs? Infrastructure-driven revival: how much priority should be given to financing new generation infrastructures (FTTH, 5G)? The big societal issues: How to reconcile the impact of digital technology and employment, training and inclusion issues? Europe as a digital power: Can Europe capitalise on this 4th industrial revolution to get back in the game, and challenge the leadership of the top American and Chinese platforms? The 2017 IEEE GLOBECOM will be held at the Marina Bay Sands Expo and Convention Centre, Singapore, December 4-8, 2017. The Signal Processing for Communications Symposium is organised by 5G PPP Phase 1 project Fantastic-5G. The issues covered in the Signal Processing for Communications Symposium are broad, spanning from traditional transceiver design to state-of-the-art signal processing methodologies in contemporary and emerging communication systems, and the application to new frontiers including cognitive radios and smart grids. Intention is to provide comprehensive coverage of signal processing methodologies, theories and practices in prevalent and next-generation communication systems and networks. ➧Click here to get more details!